Modern 4 bedroom villa on Obidos Lagoon with WiFi, own garden and private pool. Portugal Silver Coast family villa with private pool & garden, close to beaches. Stylish 4 bedroom, 3 bathroom villa set on the 'Costa da Prata' of Portugal overlooking the beautiful Obidos Lagoon. The lagoon is within easy walking distance & offers an unspoilt area of natural beauty combined with white soft sand 'blue-flag' beaches, pine woods, fish restaurants and water sports. Nearby, visitors can also enjoy the award winning Praia Del Rey golf resort and the Bom Sucesso Golf and Tennis resort, both under ten minutes away. This property has been certified by Obidos Council for holiday-lets. The villa itself is finished to an outstanding specification, with spacious rooms, terracing, balconies and furnished to ensure a rewarding, relaxing and unforgettable time for all. The living area is equipped with leather sofas, Smart TV, DVD + Bluetooth Media Player and comfortable dining. There is a rear patio and fenced private garden area with its own private pool. Available on the beautiful lagoon, 5 minutes away. Tennis available 5 minutes away ! 3 impressive Golf Courses all within 10 minutes ! Nice house, quiet location, vehicle needed. The house has a good level of finish, it was clean and easy to find. The neighbourhood is quiet and nearly all tourist rentals, so very quiet in the off season. It's a bit out of the way but near to the lagoon and a good base for the area, car needed. Many thanks for your review Nicholas ! So pleased that everything worked out for your family holiday and that you enjoyed the Obidos Lagoon and surroundings. 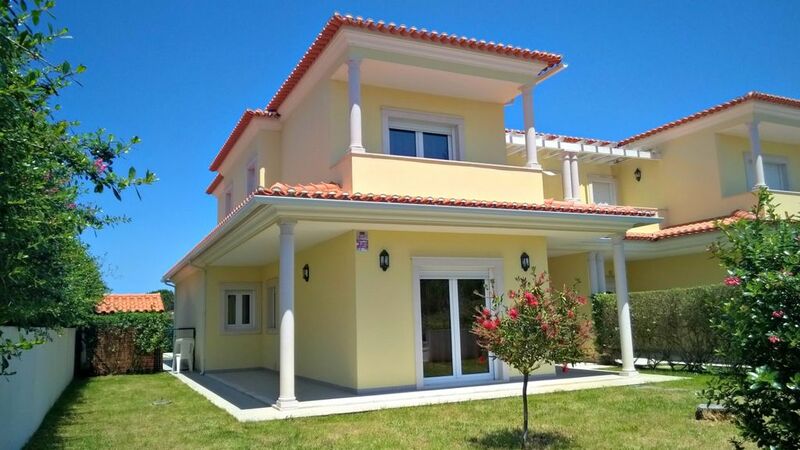 Lovely villa with a lot of space in a quiet location with a good sized pool! Has everything you need to enjoy your holidays! And also very clean. So pleased you all enjoyed your stay Jevgenija - and thank you for taking the time to review ! Had two fab weeks of family vacations! Highly recommended! Our pleasure to 'host' the Evenkamp family at our house on the Obidos Lagoon - so pleased you all had a lovely holiday. We had a lovely stay in this villa, an exceptionally well presented property, lovely pool and lots of extra games, DVD'S etc which was great for the children. A lovely quiet area which was perfect for our family break. Many thanks for taking the time to review us Helen - we are so pleased you all enjoyed your time on Obidos Lagoon and our villa ! Loved this villa, had everything we needed, plenty of space for 2 families to share comfortably. Would love to come back! Many thanks for your kind review Chloe - so pleased you liked our villa, and we'd love to have you back someday !! As the year before, we had another fantastic 2 weeks family vacation in Obidos. Thank you again Evankamp family ! We are so pleased everything worked out well again for your family holiday, and will be pleased to welcome you again on the Obidos Lagoon. Outside Bom Sucesso, and moving away from the lagoon area, there are many places of interest and activities for all the family. A 15 minute drive takes you to the beautiful medieval walled town of Óbidos. Its a good place to start, where narrow cobbled streets have bars & restaurants, shops selling local crafts & wines, beautiful churches and pretty white houses with terracotta roofs. The town hosts numerous events during the year, including classic and popular music concerts, and the Annual Medieval Fare. Recommended is a walk around the ramparts with spectacular views ! After a further 5 minutes you arrive at the lively spa town of Caldas da Rainha. Here you will find a mixture of shops for shoes & clothes, traditional coffee houses and restaurants, also the daily open air fruit & veg markets. Going slightly further afield explore the beaches of Baleal, the fishing port of Peniche and historic Abbey at Batalha. The impressive Sintra & city of Lisbon are just 50 mins drive too. OUR RATES ARE INCLUSIVE OF LINEN AND HOUSE TOWELS & CLEANING AFTER DEPARTURE. 14 DAY STAY'S ARE INCLUSIVE OF MID-STAY CLEAN AND LINEN CHANGE. Daily cleaning is available, but extra charges relate. Please ask. Deposit of 300 euros on confirmation of booking. Payment in full due 8 weeks in advance of arrival date. In High Season we look for Saturday to Saturday bookings.